The medium I chose to explore for this exercise is coloured pencil because it is one I use a lot and feel comfortable with but also feel I could explore further and learn a lot more about. It is very versatile and can be used with lots of other types of media. 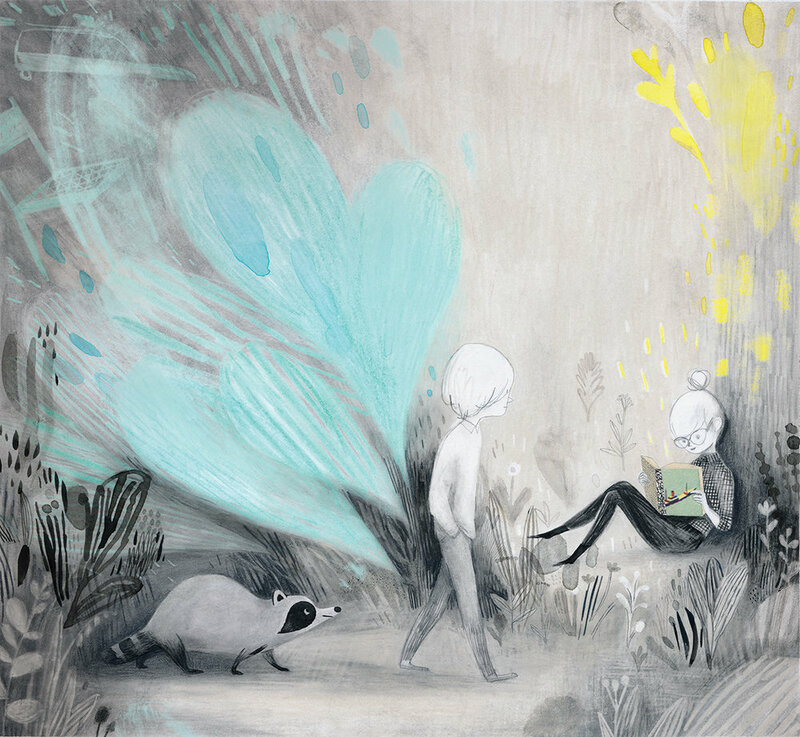 I chose to explore illustrators whom I find inspiring, all of whom use coloured pencil as part of mixed media artwork. His work is distinguishable due to his colour palettes which are usually quite tonal and use layering and blending of paint and pencil to create other colours. He makes wonderful use of negative space, often creating very light areas that contrast perfectly with darker tones. I find his creation of light really inspirational. His work often features fantasy creatures and characters and his illustration style works beautifully to create an atmospheric magical feeling. 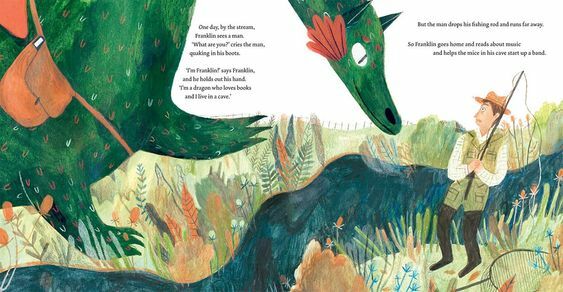 Illustrator of ‘Franklin’s Flying Bookshop’ and ‘Ivy’s Lonely Raincloud’, Katie Harnett uses mixed media including watercolour, gouache, coloured pencils and pastel. She uses coloured pencil to add detail such as veins in leaves. She uses quite a lot of white pencil, which could be watercolour pencil. Coloured pencils are also use to colour in sections, often quite loosely hatched revealing the colour of the paper or other media underneath. She also layers coloured pencil over other media to create different colours. She uses some distortion when representing buildings but her people are usually in proportion. She seems to use a colour palette appropriate for the content rather than having a particular style in use of colour. Some of her work is very colourful such as ‘The Marvellous Fluffy Squishy Itty Bitty’ in while some such as ‘A Lion in Paris’ has a colour palette of just greys, yellows and blues. 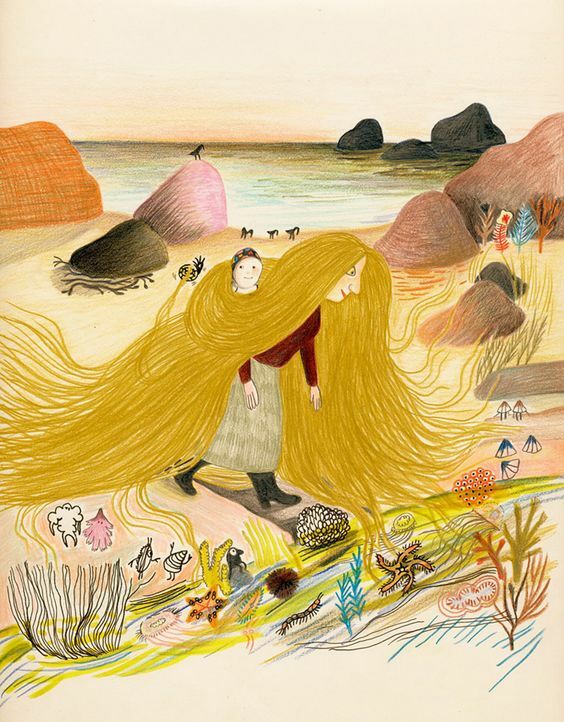 Unlike the illustrators previously mentioned, Belgian illustrator Kitty Crowther uses coloured pencils as her primary medium. She uses them to blend colours, layering to create new colours, add detail, texture and shadow. When drawing people, she exaggerates certain features by drawing them larger or smaller which fills them with character. Her work often includes fantasy characters. 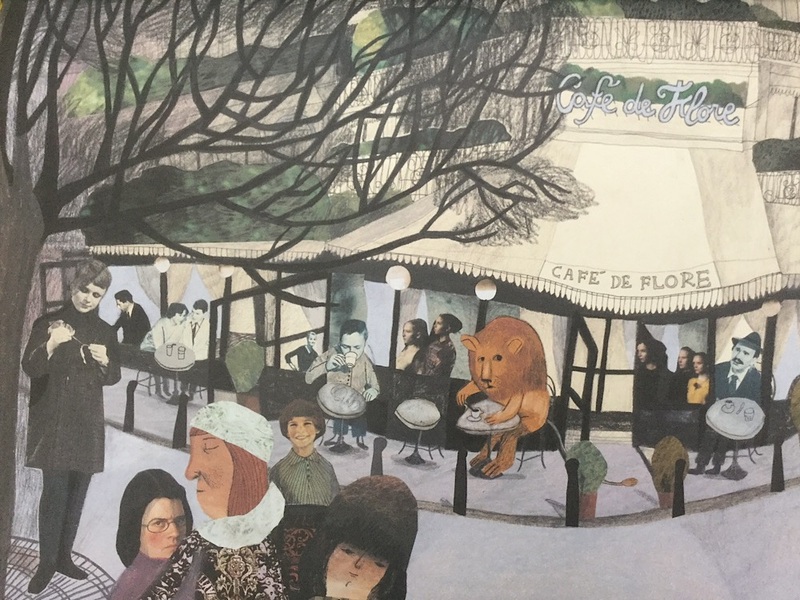 Illustrator of ‘Joan Proctor Dragon Doctor’ and ‘My Father is a Polar Bear’, Felicita Sala uses coloured pencils alongside watercolour and gouache. She layers pencil to create different colours and uses them to draw and add detail. Her shading often involves strokes drawn in randomly different directions giving a slightly scruffy childlike look. She makes creative colour choices such as pink for trees. 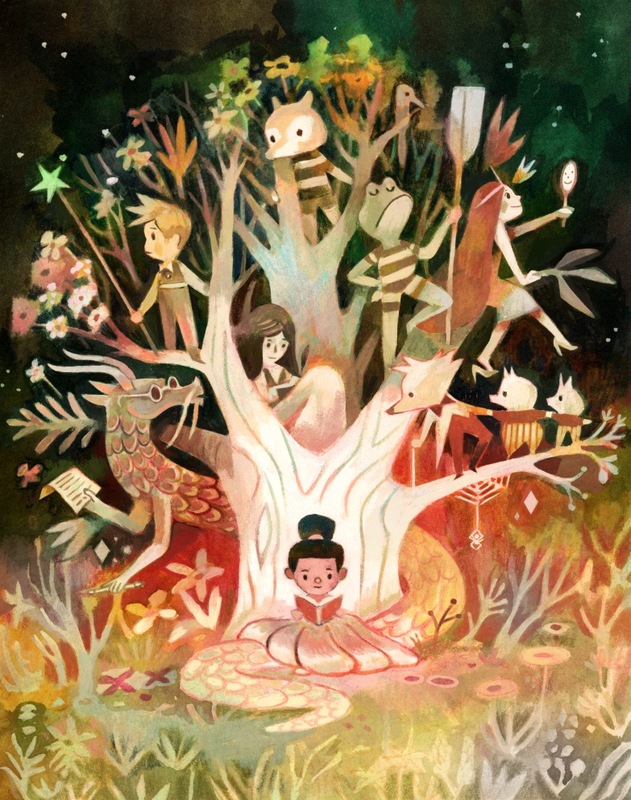 Illustrator of ‘The Promise’ and ‘A World of Your Own’, Laura Carlin uses coloured pencil alongside watercolour, gouache, pastels to draw, add detail and layer to create colours. Her illustration is very textural, created through her earthy use of the media and her allowance of the texture of the paper to show through. She often creates impressionistic scenes that are very atmospheric. Her colour palettes are generally muted, earthy colours. She uses some distorted perspective and has a naive style when drawing buildings. Her people are sometimes out of proportion with tiny heads. Before moving onto the next part of the exercise, I decided to try out some techniques I had seen in the work of the illustrators and also some others I have had on my ‘to explore’ list. They were mainly based around the potential of gouache and watercolour mixed together and pastel over gouache. I particularly like pastel over gouache unblended as it allows the colour of the gouache layer to show through. The next part of this exercise was to render an existing visual of mine in the style of some of the above illustrators. 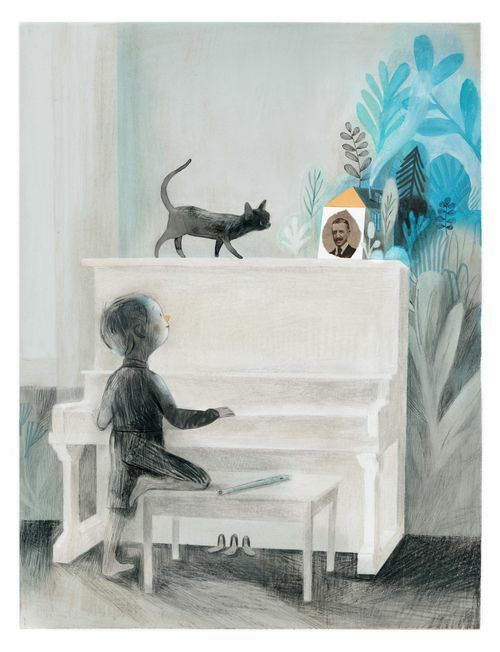 I chose Matt Forsythe and the illustration shown below because I really wanted to explore his use of light contrasting with dark tones. The interesting composition of this illustration gave me the idea to use it to re draw the artwork I completed for my first assignment for which I received feedback about trying out a range of compositions. The viewpoint of the subject of the artwork is from behind which makes the viewer feel like you are following the crocodile on his journey. The eye is drawn up from the bottom of the picture where it is dark, up into the light. The positioning of the trees help guide the eye as they create a tunnel effect that conveys a sense of moving towards ‘the light at the end of the tunnel’. Negative space in the shaft of light is used in contrast to the dark areas behind the trees and behind the crocodile. Black is used to show the shadow of the crocodile and the stick he is holding. It appears that the light is coming from a break in the trees of the forest he is hiking through, perhaps a glade. His stick and backpack make me think he is hiking or is on a purposeful journey to find something or to arrive at a particular destination. Although a sense of brightness is created, the colours aren’t actually vibrantly bright. The colours are quite muted due to them being either a darker or very light tone. A rainbowesque spectrum of colour light to dark is used from white and yellow, through blues and greens to purples and black. There is a lot of blending of colour, perhaps using pastel and pencil. Layering is used to create the darker areas where colours underneath are allowed to just show through. The crocodile itself has been stylised with distortion being used to make him short and squat in comparison with the proportions of a real crocodile. He has been given human characteristics such as standing upright, wearing a backpack and holding a stick. To create my own artwork based on this, I first sketched out a very similar composition and used graphite pencil to practise creating the right tones before I added colour. I kept my colour palette similar to the one I used in my original drawing of this and used gouache to apply a base layer. I then used pastel over the top blended with coloured pencil. The really dark areas were created using oil pastel, also blended with coloured pencil. I found this a really free way of working, I didn’t get worried about each stroke I was laying on the paper. I was also much more confident using black to darken areas. I have learnt a lot about the possibilities of different materials and would really like to continue to use these to create a freedom in my work. I have also learnt about use of tone and creating contrast which is also something I wish to take forward into future work. I chose Kitty Crowther to base my other artwork on. I made this choice because her style is very different to Matt Forsythe and she is the only one of all the illustrators I looked at who uses coloured pencil as the predominant medium. The illustration I chose is of Mother Medusa. There is an enormous sense of distance created by the composition of this illustration. We see Mother Medusa and the beach items in the foreground while the sea stretches away into the distance. The placement of the rocks behind her also help to create distance from the shore to the dune at the very front of the image. Detail such as the birds, shells and some of the beach plants have been positioned so they keep the line of the horizon while the objects in the very foreground are placed on a slant to suggest the uphill nature of the sand dune. Soft swishy lines are used to create movement. The direction of some of the beach plants and the sway in the character's hair give the impression of there being a gentle sea breeze. Generally, the elements in this image are in proportion with Medusa’s hair being the only exception! A earthy colour palette has been used which suits the beach setting. 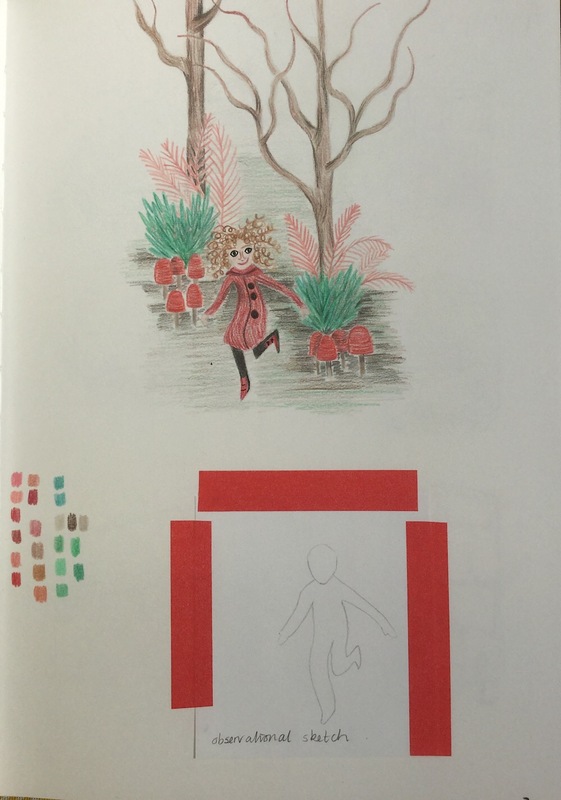 Coloured pencil has been applied in layers, light to dark. Dark tones are used for shadow. The direction of the hatching defines the shapes of objects such as the rocks and follows lines such as the horizon and shore. Pencil and ink have been used to add details such as the beach vegetation and shells. As with my illustration inspired by Matt Forsythe, I decided to use my first assignment as a basis for this piece inspired by Kitty Crowther as it provided another opportunity to explore composition. This time I wanted to create distance as Kitty did with Mother Medusa. I tried to do this by placing the character in the foreground with a narrow path following behind her. The piece was created entirely in coloured pencil layered from light to dark. I have used hatching to show direction and shape as I saw in Kitty’s work however I think maybe some lines to indicate the direction of the path may support the sense of distance. Although I don’t think I will use coloured pencil as the predominant medium in my artwork, this study has taught me a lot about layering and hatching that I will be able to take forward into my more mixed media style. Another huge learning point from both studies that builds on my understanding from Part 3 is about composition and reasoning about positioning based on the effect it creates.